Is Forever Green Actually Forever Green? Another health and wellness MLM, with a small product selection but some unique products. The unique nature of some of Forever Green’s products do provide a bit of a selling point for distributors of the company, but you are still entering into a niche with a huge amount of competition. As is always the case, you also face a compensation plan that forces you to rely on the people you recruit, which often isn’t a solid choice business-wise. In total, the site offers around 12 different products. These are broken down into the categories of FGXpress, Primary Nutrition, Weight Management and Supplements. There are good things and bad things about this selection. One bad thing is how few products there are on offer. This means that you have the potential to target a pretty limited population of potential buyers, because you have to find people who are interested in very specific things. That can be frustrating. Additionally, many of the products aren’t all that unique. For example, FIXX (a weight management product) is simply a chocolate meal replacement shake. Now, the product has some differences to other protein shakes, but there are still hundreds of different brands and varieties out there already that offer protein shakes. That makes it a pretty competitive market. However, you do have the advantage that the products are things that people use up, and relatively quickly too. For example, protein powders, supplements and similar products are all things people often use on a daily basis. This means that there is a lot of potential for repeat customers, if people actually like the products that is. The fact that the products are organic is nice, and adding fruits and vegetables is a nice touch… kind of. That approach has the downside of also increasing the sugar in the product, which isn’t ideal for a person trying to lose weight. Personally, I would prefer to add my own fruits and vegetables to a smoothie with protein powder, as that would offer more health benefits. Despite the wording and hype that surrounds the products, there is very little indication that they are healthier than many of the alternatives out there. This is really important when it comes to selling the products – as many of your potential customers will be well aware of the alternative options. A really big indication of this is that the site doesn’t even show the nutritional labels for products. In many cases they do list the ingredients, but these lists just highlight the ingredients the company is boasting about, even though there are probably many others actually in the product. Perhaps the most significant products from the company are the three FGXpress products. 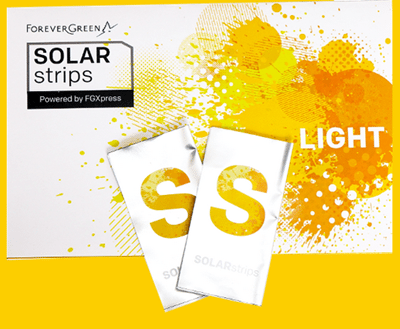 These are called POWERstrips, SOLARstrips and BEAUTYstrips (and yes, they really are written that way). Yeah, the science kind of does say that the chemical has been associated with improved telomere health, but what that actually means is less certain. There has been a huge amount of debate on the topic and there isn’t all that much evidence to suggest that the compound actually does what people want it to. Additionally, marketing the product as BEAUTYstrips is another level of manipulation. Even if the product really does help fight aging (which I honestly doubt), whether or not it does anything for beauty is a whole different story. In fact, the strips themselves are more of a gimmick than anything. Their marketing certainly makes them sound like they would work, but whether or not this is the case, is extremely difficult to know. The site simply offers a lot of hype, but little science. One key thing that makes or breaks distributors is how well they can sell the product. A critical component of this is price. If the products are too expensive, people will be much less likely to buy them – regardless of how good they might be. A major issue with Forever Green is that the company doesn’t make pricing information evident. In fact, the products aren’t actually sold directly on the site. Nevertheless, it still makes things difficult, because potential distributors really should know about the prices of the products they are going to promote before they get involved, not afterwards. There also aren’t many reviews of the actual products online, which makes it even harder to work out whether the company is worth bothering with. The reviews that do exist tend to be from distributors, so they are pretty likely to be biased. So, if you are considering getting involved with the company, you end up going in blind about a lot of things, or relying on distributors (who are pretty biased). Not a good start for making money. The products are part of the equation when it comes to making money through Forever Green, but the opportunity is just as significant. After all, this is what determines how much money you can make and what you have to do to make that money. The opportunity for the company focuses around three pillars. One is FGXpress itself (which is basically those strips products), one is Farmer’s Market (which is all the rest of the products), and the last is U of You. U of You seems to be a type of training for personal development, which focuses on the action plan, goals and interests of distributors. The training looks like it lasts one day, and it’s hard to know whether it is actually any good. If it’s anything like training by other MLMs, it’s likely to be mostly hype that tries to get you more enthusiastic about the company. 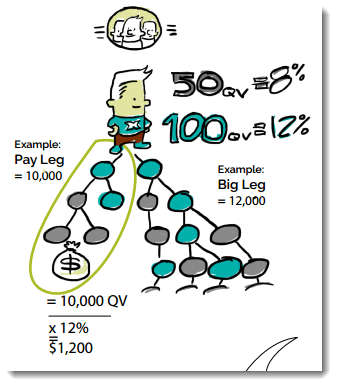 The compensation plan for the company is a bit fun to read with fun illustrations, but at the same time, it gets complicated fast (in fact, the definitions for the plan take up two pages, and the commission plan itself is only eight pages long). The idea starts off pretty simple. You earn some commissions from the sales you make, but most commissions come from recruiting others. This happens because when you recruit others, you earn based off the sales you make as well as your own. That always sounds so fantastic, but there are a lot of criteria along the way. Essentially, you end up building a pyramid of people under you by recruiting people into the company and getting them to recruit others. The idea is to have a two leg structure with a left leg and a right leg. Many of your bonuses come from where the two legs match in volume. Likewise, your ability to rank through the organization is also connected to how well the people under you do and precisely how well each side of your tree does. For example, these are the requirements to hit the 5 Star rank in the company. There are three main requirements. One is the 50 QV, which is how much you have to buy. One is the 30,000 QV, which is how much has to be bought across the entire team below you. Finally, you have to have five members below you who are at the 1 Star rank. Those requirements get higher as you go up the company, which makes them harder and harder to actually achieve. But, as you go up in the organization, you can make more money from the people below you and from greater levels below you. So, this is the challenge of making money with a MLM. To be successful, you really need to get a big team of people under you who are also doing well, both in selling and in recruiting. In concept, the potential to make money is high, but the challenge of building your team up that much is also extensive. When it comes to MLMs, most people find themselves stuck very low on the ladder in the company. They might make some money, but it will be relatively little, and it may not even be more than the amount they have to order to stay active. For me, the biggest challenge is the way that you have to rely on those who are under you – it simply isn’t possible to be successful on your own. This means that you have to support, push and prod them to make sure that they are successful. Some may be, but others certainly won’t be. You will also find that some people you recruit will end up giving up on the company or finding that they have more pressing life matters. This can also make your process of earning money more difficult, because you have to find people to replace them. MLMs love their clichés and they certainly love vague statements. Forever Green has lots of examples of this throughout their site. I mean, the following image comes from the start of what appears to be the mission statement of the site. It sounds great, very new-agey in fact. But, the sentence is really just a whole lot of jargon and no really meaning. For example, how exactly does one ‘show up authentically’? Certainly the site doesn’t bother to explain. Statements like this work well for MLMs. They make the company look like the next-best-thing and they make it look much better than all of their competitors. Yet, they are simply phrases designed to hit all the right buttons, and they tend to be quite good at doing just that. People tend to get star struck by this type of company because of its initial appearance and the phrasing used. Often they will end up buying into all the hype. But, when it comes down to it, that hype and language doesn’t really help in selling the products. Instead, your success is more about the products themselves and your ability to sell things. At the same time, the language and the hype that Forever Green spins is similar to so many other MLMs out there. So, don’t fall into the trap of thinking that you actually are selling something unique or life-changing. Instead, try to step back and be realistic about the company. Do you think you could sell the products and recruit people? If so, who? Do you have enough of an audience? Direct selling is a lot more difficult than it seems and you really need to make sure you know exactly what you are getting into. I may seem harsh on MLMs in general, but I have good reason to. So many people get into these companies thinking they have found an amazing opportunity, yet it is just the same manipulative scheme that is used over and over again in so many different companies. Yes, it’s possible to make money through a MLM and a handful of people will even make a lot of money. The real catch is that most won’t, and there is a lot of criteria to meet and rules to follow if you want even a chance of making a decent income. Without a doubt, MLMs are complicated. I’ve known people who got involved in them in the past and many struggled to understand the criteria and what exactly they were supposed to do. At the end of the day, the approach is stacked heavily in favor of the company and they make money much faster than you do. People turn to MLMs because they think that working for a company is the only way to go. But it isn’t. Why work for someone else when you can start your own business? With a simple WordPress website you can make sales from ads and affiliate products, and pretty much talk about anything you want. No need to push a product!